The Light palette provides up to 4 lights, as well as modifiers for customizing them. Select lights, and turn them on or off, by clicking on them. The current lighting setup, containing all 4 lights, can be saved to a single disk file. Similarly, all 4 lights can be replaced by loading a file from disk. Note: MatCap materials do not respond to changes in the Light palette. MatCap materials have the light baked into them. The Load Lights button loads a previously-saved configuration defining up to 4 lights. All lights in this palette are replaced by the loaded configuration. The Save Lights button saves all 4 lights and their modifiers to a file, whether activated or not. Use the Light Position window to adjust the position and direction of the selected light. Click and drag the light dot to position. Press any of the Light icons to select them; press them again to turn them on or off. 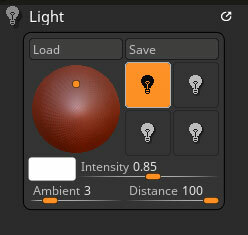 While selected, the light’s type, placement and attributes can be modified. The Light Color swatch displays the color of the selected light. You can change this color to the current Color Palette setting by clicking this swatch once. You can also click this swatch and drag to another point on the canvas or interface to select the color at that point. The Light Intensity slider determines the brightness/dimness of the selected light. The Ambient slider determines the overall lightness of the all lights directed at the model. The Distance determines how close all the lights are to the model. Lower values will give harsher lights and stronger shadows.